Naruto Manga Chapter 487 "The Battle Begins". In this chapter is tell about Zetsu, a creature who may or may not even be human, ever flitting in and out of a world of darkness, he called as The "Magician's" Assistant. Naruto already declared his war to Sasuke, and others like Sakura and Kakashi can't do anything about that, they only can do are believe in them. Then Sasuke and Madara disappear from team 7. Sasuke ask madara to do something about his eyes. Sasuke want itachi's eyes to be transplanted to him as soon as possible. Sasuke want to destroy Naruto with his full powers, because that's the only way to reject everything Naruto stands for. And Naruto get colappsed because of Sasuke used Kunai which Sakura poisoned on it. 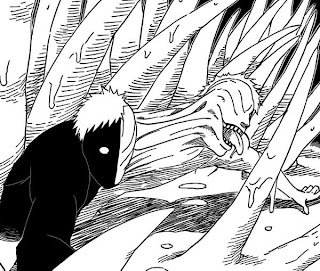 Chapter 487 also revealed that Kisame not truely was defeated by killer Bee and his brothers, they only defeated zetzu cloning. When Killer bee has being fighted Kisame, White Zetsu switched his place with Kisame. What are they gonna do by doing that? In the end of this chapter Kabuto appear with his new power.